The Most Serene Republic of San Marino ( Italian: Serenissima Repubblica di San Marino) is the third smallest nation in Europe (after Monaco and the Holy See). Located in southern Europe, it is an enclave surrounded by Italy, and is one of the European microstates. San Marino is the oldest constitutional republic in the world still in existence today. It was founded in A.D. 301 by Marinus of Rab, a Christian stonemason fleeing the religious persecution of Roman Emperor Diocletian. San Marino is the fifth least-populous sovereign country in the world (larger only than the Vatican City, Tuvalu, Nauru, and Palau). It is the smallest member of the Western European and Others Group (WEOG) unofficial political-geographical grouping of the United Nations. It is also the smallest non-English speaking member of the United Nations. It is the smallest country or other jurisdiction participating in European football competitions. According to legend, Marino left the Adriatic island of Rab with his lifelong friend Leo and went to the town of Rimini as a stone worker. After persecution because of his Christian sermons, he escaped to the nearby Monte Titano, where he built a small church and thus founded what is now the city and the state of San Marino. The official date of foundation of the Republic is 3 September A.D. 301. During the early phase of the Italian unification process of the 19th century, San Marino served as a haven of refuge for numerous persons who were persecuted because of their support for Italian unity. In memory of this support, Giuseppe Garibaldi accepted the wish of San Marino not to be incorporated into the new Italian state. During World War II San Marino was able to officially remain neutral during World War II. Axis forces retreated through the country and were persued by the US and Great Britan. The allied troops left the country a few weeks later. The head of state is a committee (council) of two captains-regent. San Marino also holds the record for the world's first democratically elected communist government, which held office between 1945 and 1957. San Marino became a member of the Council of Europe in 1988 and of the UN in 1992. It is not a member of the European Union. The Consiglio Grande e Generale ("Grand and General Council") is elected by popular vote every five years. This parliament selects two of its members to serve as Capitani Reggenti ("Captains Regent") for periods of six months. The Capitani Reggenti and the cabinet form the executive branch of the government. The Council also elects the Consiglio dei XII (Council of Twelve), which forms the judicial branch during the period of legislature of the Council. 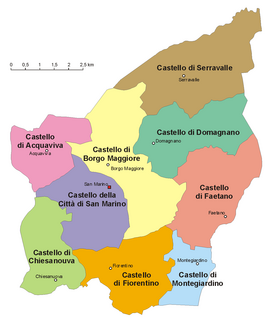 San Marino is divided into the following nine municipalities, known locally as castelli or castles (sing. castello, each on a different hill, as depicted on the republic's coat of arms), that are also towns to the world. The largest town of the Republic is Dogana, which is not an autonomous castello but rather belongs to the castello of Serravalle. Each castello, like Italian comuni, includes a main town that is the seat of the castello, called capoluogo, and some even smaller localities known as frazioni. San Marino is an enclave in Italy, on the border between the regioni of Emilia Romagna and Marche. Its topography is dominated by the Apennines mountain range, and it has a rugged terrain. The highest point in the country, Monte Titano, is situated at 749 metres (2,457 ft) above sea level. There are no bodies of water of any significant size. The climate is Mediterranean, with warm summers and mild winters. Although San Marino is not an official European Union member, it is allowed to use the euro as its currency by virtue of arrangements with the council of the European Union; it is also granted the right to use its own designs on the national side of the euro coins. Before the Euro, the Sammarinese lira was coupled to and exchangeable with the Italian lira. The small number of Sammarinese euro coins, as was the case with the lira before it, are primarily of interest to coin collectors. 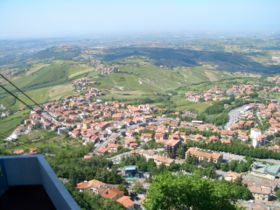 The tourist sector contributes over 50% of San Marino's GDP, with more than 3.3 million tourists visiting in 1997. Other key industries are banking, electronics, and ceramics. The main agricultural products are wine and cheese. San Marino's postage stamps, which are only valid for mail posted within the country, are mostly sold to philatelists and also form a source of income. The per capita level of output and standard of living are comparable to those of Italy, which supplies much of its food. There is no significant difference between the demographics of San Marino and Italy. The state has a population of approximately 29,000, including 1,000 foreigners, most of whom are Italians. About 5,000 Sammarinese live in foreign countries, predominantly in Italy. The language spoken is Italian, with the Emiliano-Romagnolo dialect, and Roman Catholicism is the predominant religion.